The iOS interface environment for your app, defined by traits such as horizontal and vertical size class, display scale, and user interface idiom. The iOS trait environment is exposed though the traitCollection property of the UITraitEnvironment protocol. This protocol is adopted by the following classes: UIScreen, UIWindow, UIViewController, UIPresentationController, and UIView. To create an adaptive interface, write code to adjust your app’s layout according to changes in these traits. You access specific trait values using the UITraitCollection horizontalSizeClass, verticalSizeClass, displayScale, and userInterfaceIdiom properties. The values that express idiom and size traits are defined in the UIUserInterfaceIdiom and UIUserInterfaceSizeClass enumerations; the value for the display scale trait is expressed as a floating point number. To make your view controllers and views responsive to changes in the iOS interface environment, override the traitCollectionDidChange(_:) method from the trait environment protocol. To customize view controller animations in response to interface environment changes, override the willTransition(to:with:) method of the UIContentContainer protocol. 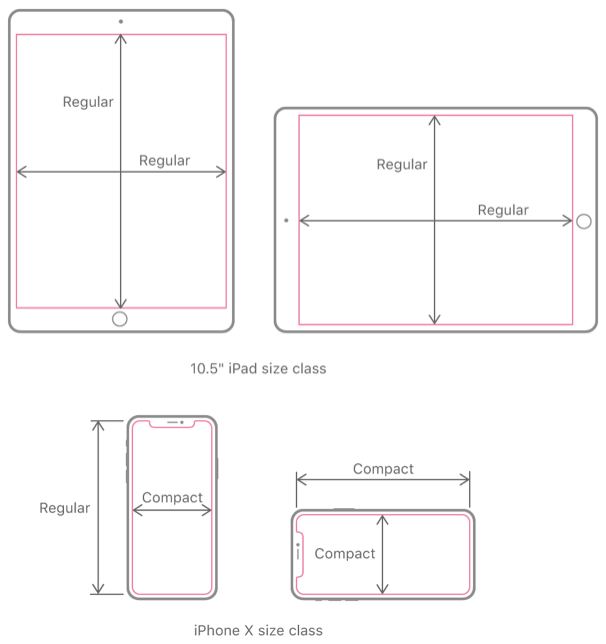 Figure 1 shows the horizontal (width) and vertical (height) size classes your app can encounter when running on various devices fullscreen. For information about size classes your app encounters in Slide Over and Split View on iPad, read Slide Over and Split View Quick Start in Adopting Multitasking Enhancements on iPad. You can create standalone trait collections to assist in matching against specific environments. The UITraitCollection class includes four specialized constructors as well as a constructor that lets you combine an array of trait collections, init(traitsFrom:). One important use of standalone trait collections is to enable conditional use of images based on the current iOS interface environment. You can associate a trait collection with a UIImage instance by way of a UIImageAsset instance, as described in the overview section of UIImageAsset. For information on configuring asset catalogs graphically from within the Xcode IDE, see Asset Catalog Help. You can employ a standalone trait collection to enable a two-column split view in landscape orientation on iPhone. See the setOverrideTraitCollection(_:forChild:) method of the UIViewController class. A standalone trait collection is also useful in customizing view appearance, by way of the appearance(for:) protocol method, as described in UIAppearance. Because a user can turn off 3D Touch in Settings, check the value of the forceTouchCapability property in your implementation of the traitCollectionDidChange(_:) method, and adjust your code paths according to the property’s value. The horizontal size class of the trait collection. The vertical size class of the trait collection. Defines the size class of a view. The display scale of the trait collection. The gamut of the current display. Constants indicating the gamut of the current display. Returns a Boolean value that indicates whether a trait collection contains all of another trait collection’s values. Change images and resources dynamically when the screen gamut on your device changes. A representation of the current device. A collection of methods that makes the iOS interface environment available to your app. A set of methods that, in conjunction with a presentation controller, determine how to respond to trait changes in your app.